Last week was National Infertility Awareness Week in the USA. I’m Canadian, so technically it doesn’t apply to me. But, I have always provided my voice to this movement because I’m pretty sure no-one cares about my geographical location when it comes to infertility awareness and advocacy. I planned to write something last week, then Friday rolled around and I still hadn’t really found my words. So, please accept this post a few days late. Stress can cause miscarriage, you need to de-stress your life. Have you tried pineapples and pomegranates? They are great for pregnancy. I cannot count the times I’ve told people that relaxing doesn’t help, and stress doesn’t cause baby loss. In fact, after our fourth loss I quit my high stress professional job to try one more time “stress-free” and in a “relaxing” state. Guess what, we still went on to lose our 5th pregnancy. To chalk baby-loss and infertility up to things like relaxing, stress and consuming pineapples is nothing short of infuriating. And as someone who has adopted, I also feel the need to state that that adoption simply is not a cure for infertility/baby-loss or take away the years of pain and suffering. In fact, I have medical reports from a highly respected Doctor who specializes in recurrent pregnancy loss to prove the likely cause of our losses, and we know without a doubt that our losses are due to a medical condition within my body. No, I don’t have to explain this to everyone I meet, just as no-one with any other medical condition has to explain their medical reports to everyone they meet in life. And, honestly, I prefer not to explain to everyone that my body has killed 5 babies, it’s not a fun thing to discuss. But people do need to understand and respect this illness for exactly what it is, a medical condition. Infertility is a life long medical condition. Just like stroke, heart conditions, diabetes, etc. And leading a healthy lifestyle is important for all medical ailments, but no amount of pineapples is going to cure pregnancy loss. Just like no amount of kale is going to fix a heart condition. I guess, if I had one thing to say today, it’s be respectful of infertility as a medical condition. If you are talking to someone who has experienced infertility don’t pry for details and also don’t offer half-hearted advice. Instead, admit you don’t know that much about what they are going through, but you’d like to learn so that you can be supportive. Offer a listening ear whenever they need it. And if someone is going through a miscarriage, ask them how you can help but only if you really mean it – simple things make all the difference because miscarriages can take weeks and are all consuming. Offer to take their dog for a walk, bring over a fresh cooked meal, send flowers to let them know you care, and let them talk even if what they say is hard to hear (remember as hard is it is for you to hear their story, they are actually living it day in and day out). The friends who stood by us and showed us patience through our losses will always have a special place in our hearts. So, if you can, be that person for your friends. Well put. After 6 failed rounds donor egg IVF and miscarriage and now our international adoption program being suspended after waiting for a match for two years, not to mention over $60,000 down the tube, we don’t belong to any club. If we want to have a family we’ll have to come up with at least $30,000 more to try domestic adoption, and right now I can barely see straight. After the 6th fail and the adoption falling through the day before our last BFN, we received the usual “I’m so sorry” emails from people and that was it. Two people, my massage therapist and the lady who gave me my Reiki on the day of my last transfer, we’re the only people who asked what they could do. However the thing about this kind of grief is so similar to death, as this time around I feel the same level of grief I felt when my father died, and I literally don’t have the energy to come up with something to tell people to do for me. I’ve always said when someone is grieving that you just do something for them rather than put the ball in their court to come up with something to make you feel better about helping them out. Whether it be a card or flowers or sending them a gift certificate for a massage (or simply just say ” I want to come over and see you, how’s ____ date look?”), as the person not dealing with infertility one needs to just do something and not expect the person going through deep grief to come up with the idea. I’m a person who can’t ask for help anyhow and right now the last thing I have any energy for is telling someone what they can do for me… When my dad died the best thing was having a friend just come over and sit on the couch and let me cry. Yet most other people did nothing. Infertility knows no boundaries, unfortunately it is everywhere. 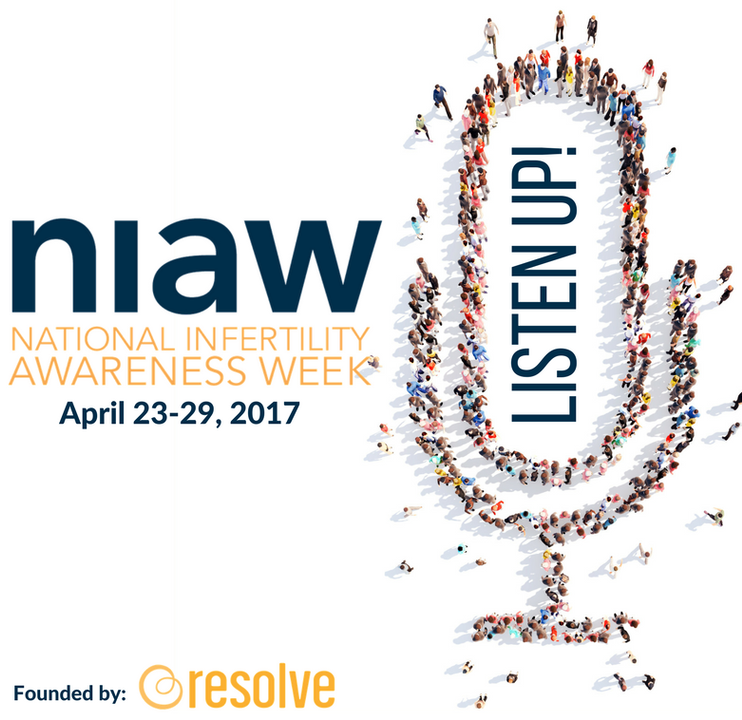 Thank you for sharing your words and story in honor of (Inter)national Infertility Awareness Week. It is so important to help others around the world with this difficult struggle. We don’t always know what type of help we need…we just need someone to offer. Thanks again for sharing! Very well said. Infertility doesn’t care who you are or where you live. I love your tips for supporting someone through a miscarriage. Especially only offering to help if you actual mean to! Hugs! I think your point about this being a true medical condition is very important. Even I, a woman who has 2 kids from 4 rounds of IVF, tends to forget that. I brush it off, because we’re done having babies, and try to put it all behind us. Just last night, though, my husband and I were watching, “How I Met Your Mother,” and Lily and Marshall decide to try for a baby, and Brian asked, “does this annoy you as much as it does me?” I was surprised that he still thinks about it, but your post makes it obvious why he does – he HAS male factor infertility and that will never change. I was lucky to have friends who had gone through the same thing, and one going through it as the same time as us, and they totally understood it. My family had no clue how to handle it, and handled it very badly most of the time, but my two closest friends knew to just listen. As I have mentioned before, I have never experienced infertility myself, but I started reading these blogs due to my daughter struggling with infertility. It has helped me tremendously to understand her struggles and how to talk to her about them. This blog describes exactly what she goes through and describes the exact things that people say to her on a regular basis, due to lack of understanding. I try to explain to family members how it makes her feel to say “just adopt” or “It will happen one day, just relax”…… but they still really don’t get it, and I honestly know they do not mean to be hurtful with saying those things. I guess it is truly something you can’t fully understand unless you are living through it, or watching a very close loved one live through it. Just like many other diseases… you never know a person’s struggles until you walk in their shoes. I am seriously thinking about printing out your blog, to hand out to those family members who continue to say these things when speaking to her! Your daughter is very lucky to have such a strong ally by her side. Sometimes, moms’ don’t get it either and it stings, because Mom is supposed to know and understand! The just adopt line irritates me to no end. Also, the others people have said, there are so many babies who need a family, why do you want to struggle with miscarriages when you can just give another baby a life? My own mom could never be appropriate, she always assumed it happened and if we relaxed adn didn’t think about it, it will happen! Now that we have our kids, she tells us, see I told you to relax, it will happen. NO need to go for these extensive medical interventions! Hurts.. but yes, sometimes people have no clue and it hurts more when its family. I loved the instruction on how to be a good friend during baby loss and that it can take weeks. So few people know this. In general, we’ve felt saddened when friends close enough that we’d tell of a loss of a baby, and after years of IF (and at times like birthdays or anniversaries) stayed far away and without any caring communication. I was surprised that not even a text of “how are you?” Or “do you need any help?” was sent. I must admit that the mental part of it gets heavier for me as I keep more to myself after these experiences. In busy days, especially for those with families and lots of activities, it seems to take a very special person to make that visit, offer a hand or gesture or heart. And sometimes, those people and gestures save you. Thank you for sharing your story past, present, and your hopes for the future. I hope that someone in need finds this post and learns that they are not alone. Or perhaps someone searching for how to support those in need will find your words helpful. Very well put! Wonderful post. You nailed it. Wonderful post…especially that 2nd to last paragraph! Great advice for those around us! I wish people wouldn’t offer ‘advice’. I don’t want their ‘advice’ and their hope, I just want someone to listen and cry to and all they have to do is hug me and say “I’m sorry”. It’s not even just friends, I find my husband always says these things to try to make me feel better, but it is just because he doesn’t want to see me sad. But I have to keep reminding him that I AM sad, and that is OKAY. I don’t need advice, or an explanation, I just need someone to LISTEN! Awesome. I feel exactly the same way about my own infertility. I have an undetectable egg reserve and am using my sister as an egg donor. No amount of relaxing is going to get me pregnant! I love your kale and heart disease analogy! Lots of love. after more than half a decade of infertility, I get ‘see, you just needed to relax’ ALL THE TIME. Usually I just grit my teeth and try to change the subject, because if I do try to make it a ‘teachable moment’ people seem to think I should be ‘over it’ because I’m now on the other side of the fence. Maybe I should print out copies of this post to hand out!